Sometimes it is really hard to say goodbye- like when people we love die. 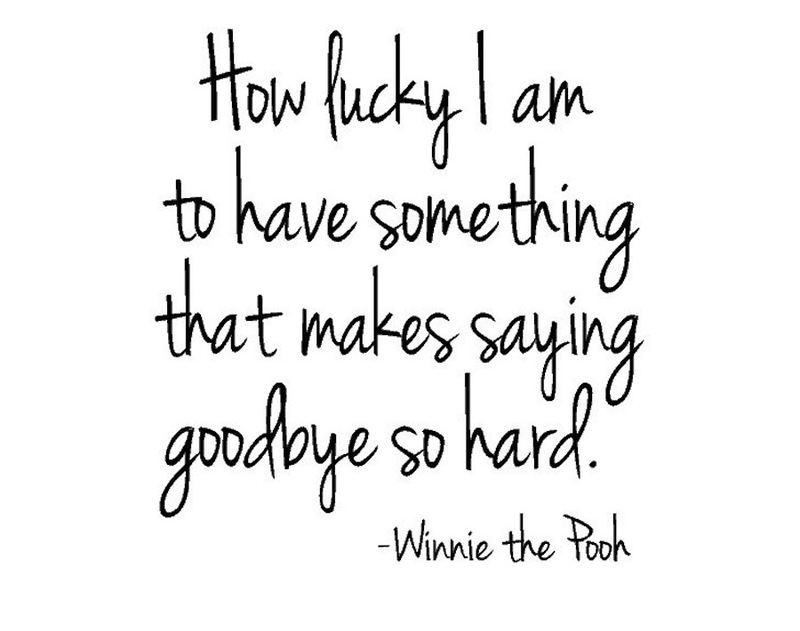 Sometimes it is really easy to say goodbye- like when you know you’ll see someone tomorrow. And then there is saying goodbye in the church. And that feels so different. When we talk about church as a family or a home, it makes it very hard when people leave- regardless of their reason. And people leave their churches for all sorts of reasons. They move. They get married and join their spouse’s church. Their needs change. They change. The list goes on and on. And while what draws us to church might be very different- the church has only one main goal- to form and send disciples into the world. Because being a disciple is what we are called by Jesus to be. And not just a disciple- but a disciple who makes other disciples. In light of this scripture, it is best to remind ourselves, that the church is more than a family or a home. It is also where we go each Sunday to PRACTICE being disciples. It is the place to practice being disciples, so that way come Monday morning, we are able to go into all nations- Toyota Nation, Wells Fargo Nation, and even “in your own house” Nation- and make disciples. Church is a safe place to practice, learn, experience, and grow as disciples so that we can go out and witness to Jesus Christ in the world- and make disciples. We stay at church to practice being disciples- so that come Monday morning we can go into our nations…and make disciples. But sometimes we forget this command from Jesus. We can think that the church exists to meet only our needs, when actually we exist in the church for the purpose of making disciples. All of the other great things the church offers- fellowship, friendship, and family- is icing on the cake. Delicious and life giving, but still icing. And so, when people leave- or if there comes a day when you leave- know that as a disciple AND as someone who is part of a family, saying goodbye is important and necessary. Say goodbye. Tell people if you are leaving. Allow for people to say goodbye to you. 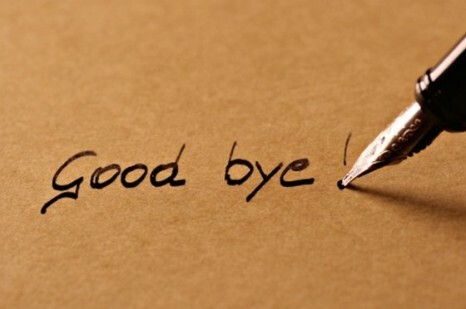 Say goodbye to people who are leaving. In this digital age, it is easy to stay connected- so make the effort to say those sometimes difficult words to say. Talk to your priests. Feeling that perhaps it is time for you to leave? Feeling sad that someone has left? Feeling anxious about what people leaving may or may not mean? Please, talk to your priests. We can offer prayer, support, context and perspective that would be difficult to find elsewhere. Grieve. It is a loss when people leave. It is a loss to leave a church. Allow yourself to grieve this loss. Also know that as new people arrive in churches, they too may be in grief from leaving a church. Be gentle with each other. Remember that the Body of Christ is bigger than the walls of a building. We do not stop being brothers and sisters just because we worship in different places. Leave on good terms if you can. Know that people come and go from churches all of the time. Some you will notice are gone. Many you didn’t notice when they were there, and so you never noticed when they didn’t come back. The coming and goings of people to churches is seasonal and cyclical- and each of us will have seasons and circumstances in our lives that will initiate the coming or going from one church to another. Pray and be prayed for. Let your church pray you into a new community that will help you continue to grow as a disciple. Pray for people as they journey- knowing that finding a new church is a journey that requires faith and courage. Lastly, know that you are loved. In your coming and going, as a disciple and as a beloved child of God. You are loved. Alcohol ain’t no joke. Seriously. This picture has been in my Facebook news feed for the past few weeks. I’ve seen it posted in clergy groups, by parishioners to their priest’s Facebook pages, by clergy themselves, and even a few Bishops have shared this picture. Take a close look at it. Now, don’t mistake me for a stick in the mud- I get full well that this is a joke. Ha. Ha. But I am really tired about the way that alcohol is used as a “joke” among Episcopalians. And it needs to stop. Because alcohol is no joke in the Episcopal tradition- and clergy especially should be mindful of what these jokes are saying about us and what they are saying to those we lead. Because we are a tradition where alcohol is used and abused by many- and yet is also treated cavalierly by clergy and lay alike, creating an environment where people are enabled in their addiction and unhealthy dependence is even, in some circles, encouraged. I am not saying that drinking alcohol is bad. Far from it. What I am saying is that joking about alcohol- and in the instance of the picture above, that clergy are drinking while not only WORKING but PROCLAIMING THE GOOD NEWS OF JESUS- is in poor taste. And gives the wrong impression. And just ick. And that we as a denomination need to be more mindful about our relationship with alcohol- how we talk about it, how we consume it, and how we think about it. We need to be mindful about the messages that we are putting out into the Kingdom- and the message that alcohol is a joking matter has no place in the Kingdom. And joking about something so serious only helps to keep those who need help in the shadows of their addiction- and we should be people of Light! We should be a people who encourage people to live into who Christ calls them to be, not enabling addiction or unhealthy relationships with alcohol OR cultivating environments in which darkness, secrets, and shame run rampant. *In my quest to see if the artist of the above cartoon is an Episcopalian (his personal blog is down and Google failed me) I did see that he has criteria to use his work. I offer this link to his site to be in bounds for using this drawing. 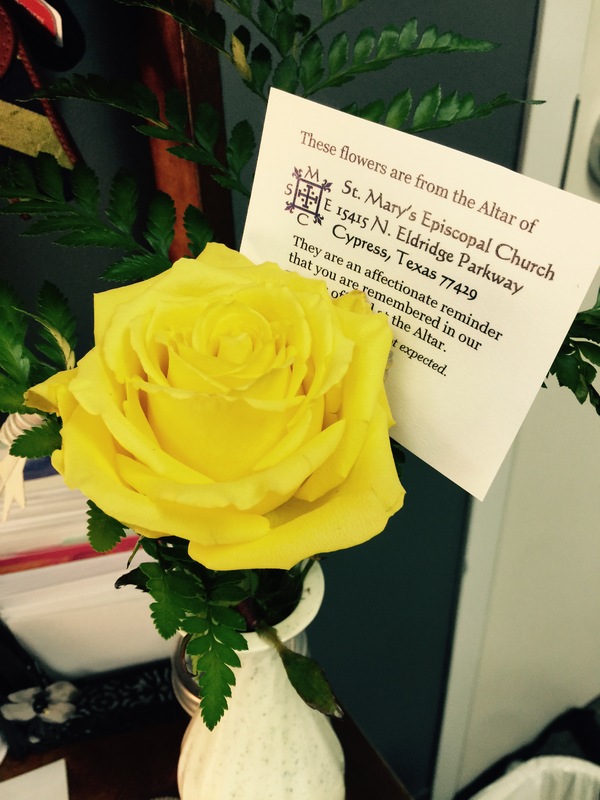 It is the custom at St. Mary’s that we send the Sunday altar flowers to visitors and folks who might need a little pick me up: recovering from surgery, birthday, because your name jumped into our hearts. Dedicated volunteers arrange the flowers and other dedicated volunteers deliver them. Just a way to share a bit of God’s beauty. I walked into my office yesterday morning to see a single, beautiful, yellow rose on my desk. A yellow rose from Sunday’s flowers. My mom- who died in 2006 when I was in college- loved yellow roses. They were her favorite. My family and I laid yellow roses on her grave stone. My dad and I held a yellow rose when we danced the father/daughter dance at my wedding. To some the yellow rose may belong to Texas. But to me it is my mom, and it was a gift to see her on my desk this week. Gratitude to the person who left it there- you have no idea of the enormity of this little gesture. May this serve as a gentle reminder that it is the little gifts- the little gestures of love and tenderness- that swell the hearts of those who receive them. Scarcity- the notion that there isn’t enough- sneaks into our churches and our lives with Christ. Not enough resources, not enough people, not enough caring and love. Oh how I wish we were immune, but we aren’t. And we try- I see the efforts of many as they combat the pervasive culture of scarcity in their lives- but it still creeps in and we are constantly having to remind ourselves that God does not operate in scarcity. Because this is how Jesus showed those who seek him his love. Jesus meets us where we are- and if that is at the hem of his cloak then that is where he will be. But he is also with us at our most tired and joy filled moments. When we are rejoicing in our success and frustrated in the shortcomings. Jesus will meet us at the hem of his cloak, only to reach down his hand and pull us up into a warm embrace. Jesus is constantly saying to us that we are worthy. Worth loving, worth healing, worth saving from ourselves and worth saving from the world. 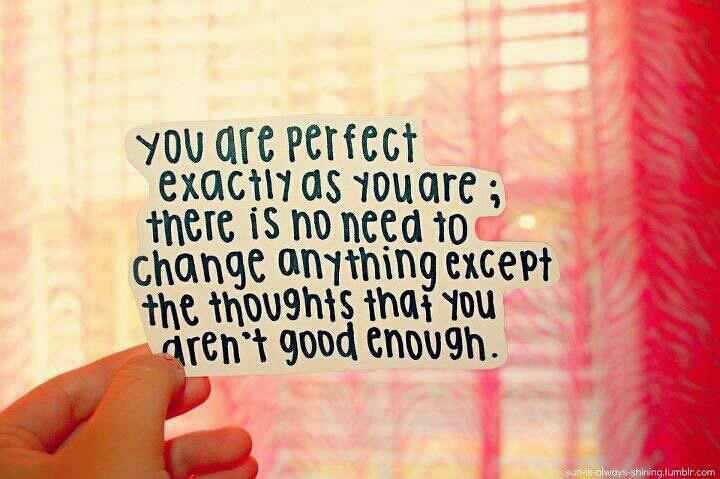 We are enough- good enough smart enough beautiful enough faithful enough as beloved children of God. There is no scarcity in Gods love for each of us. 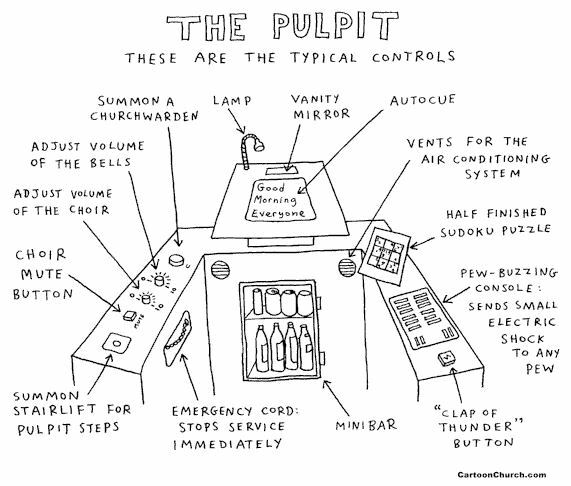 In preparation for my sermon this past Sunday- July 5th- I ran across an older post by David Lose on Working Preacher. He shared this prayer, written by Pastor Meredith Musaus and prayed at Holy Cross Lutheran Church in Menomonee Falls, WI. “L[eader]: Let us pray together. C[ongregation]: Your church is composed of people like me. I hope you noticed that it is a prayer that is prayed aloud by the congregation, not one prayed on behalf of the congregation by the leadership of the church. That’s important. In a world in which perception and reality are often confused, this prayer helps us to remember what the reality of a disciple of Jesus Christ actually looks like. It looks like you and me doing the work of the Gospel- living it, breathing it, and sharing it with others. The rub of course is this: if we don’t actually do what this prayer bids, we too will fall into the trap of thinking our perception of who we are as disciples and a church community is our reality. We run the risk of our actions not reflecting our words. We run the risk of limiting the power of Jesus in our lives and the lives of others, if our concern is just that people think we are good Christians rather than actually being a good Christian.